Ha, forgot to post this here. Only Riku brought the latest issue of Spider-Man to read during his hair cut and Sora loves Spider-Man (because a hero that has to deal with school-work on top of saving the world is something he easily relates to?) 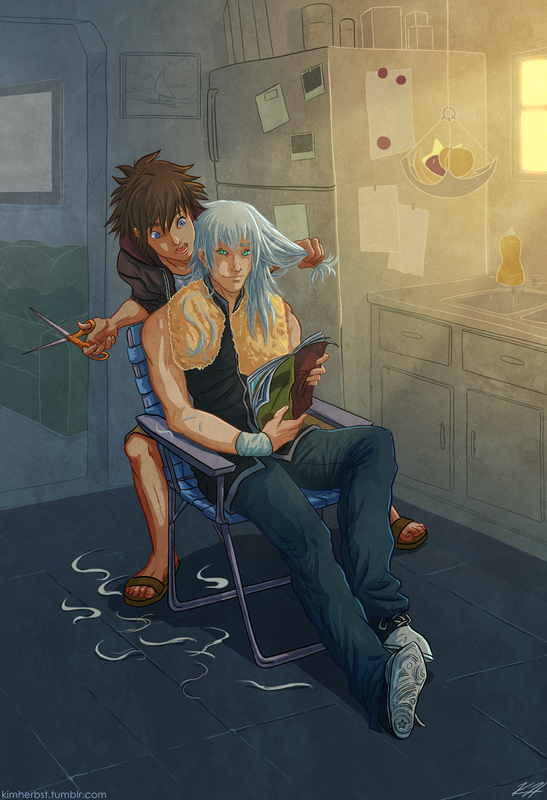 so he’s not doing a good job of paying attention while cutting Riku’s hair. If this is how it went down, then I am perfectly fine with him having shorter locks. I’m actually in the midst of playing Kingdom Hearts: Dream Drop Distance right now, and goddamn these two cute bastards. If these guys aren’t an official couple in KH:3, they’re doing the story all wrong. …I’m cool with ‘em as best bros too, to be honest. But come on. You’re not foolin’ anyone, Nomura.